Up until very recently, we had two cats, but we are sadly down to just my boy, Oliver. 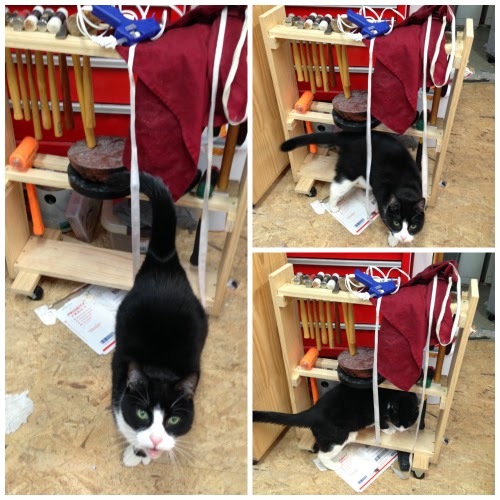 There are perhaps a million reasons why a cat and my workshop are not the best combination; however, he likes to visit, and it's rather difficult to keep him out one hundred percent of the time. There are plenty of chemicals about, the cat could decide to drink. I am careful to keep them closed when I am not around. I have never caught him trying when I am there. Hopefully this is due to an unpleasant odor. Oliver seems to understand that, perhaps, standing in front of a lit torch is not advisable given the likelihood of becoming roasted cat. He does, however, enjoy lying on top of my charcoal block once it has cooled down enough to not burn him. I don't recommend bottling the perfume smell of burnt cat fur, which he leaves behind from shedding! In addition, he loves standing on my jeweler's bench while I'm sawing, as he knocks tools onto the floor. Is this behavior sanctioned? Of course not. Nor do I approve when he tries to walk over an active wet painting. Nothing quite like paw prints all over the piece and shop. Amazingly, despite what a pain these pets can be, a number of artists keep them around. Abby of Abigail Leigh Handbags has two cats who keep things fun by sitting in the way of her sewing machine, especially her boy, Boh. Meanwhile, Lucie of Lucie Wicker Photography can't get to her hard drive, because her beagle, Apollo likes to use it as a head rest. She says her sweetheart is everything wonderful and negative you hear about beagles, but he's completely lovable. Susanne of Enchanted Hue has a Chow-Chow-Border Collie mix named Shadow who can cause some really disturbing results when she is snow dyeing fabric. One has to be careful of certain types of yellow snow, if you know what she means! While Liz of Lush Beads doesn't bring her cat, Miss Cleo, to the studio, she does bring her work home with her. Miss Cleo loves to try to eat thread and glue, and she is a real fan of Liz's beaded spiders. 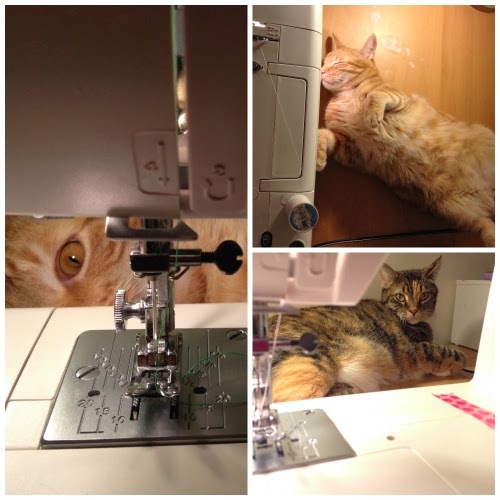 Bev, of Linkouture, has Leo, a cat who enjoys supervising the process by keeping a close eye on things! Kerrie of Cody's Creations not only has two dogs, Kona and Pepe; her business involves them. 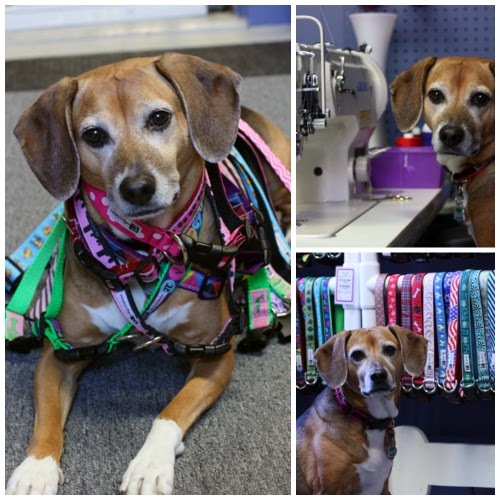 She makes beautiful durable pet collars, leashes, and other pet supplies. When she goes to her studio, she will bring Kona with her. If no one else is there, Pepe can come too, but he sometimes has "people" issues. It is important we are aware of our animals' reactions to others for everyone's safety. Why do we allow them into our workspace, if they can wreak such havoc? 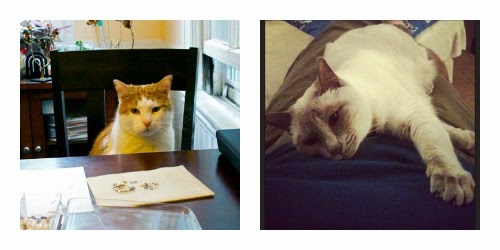 Our pet helpers do actually provide assistance. 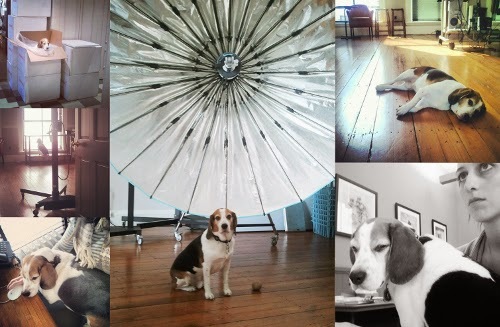 Normally, Stephanie of Stephanie Cave Design dachshunds, Berk and Ernie huddle up quietly in blankets, but occasionally they bark at passersby, who usually laugh; however, imagine you are in your studio alone in a big empty building. Your dog(s) can provide you companionship, but even more so, their ears perk at unfamiliar sounds you may not hear. They can alert you to an unwelcome intruder. If you are an animal lover, pets have been shown to be good for your health. They provide relaxation, friendship, and they can lower your blood pressure. Despite the nuisance they can be, there is good reason to keep them around.